This is the third of a series or reports about tourism. The School of the Air goes the extra mile in its contacts with tourists: There’s always “a real person” for them to talk to, and who will answer questions, says Bill Newman, Middle Years Team Leader. “Some visitors are really moved,” he says. Mr Newman, who met his Dutch-born partner while she was visiting the school, says it is unlikely to be the sole reason for anyone deciding on a holiday in Central Australia. But it fits well into the mix of attractions and its personal touch probably makes it the stand-out. 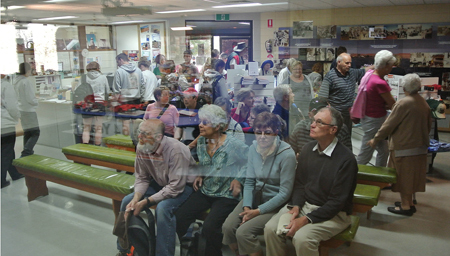 Visitors are in a room, watching remote teaching of 122 students spread over 1.3 million square kilometres through a big glass window. But no doubt it would be a more exciting experience to see it from the other end, in the school room on a cattle station or in a remote community. Mr Newman isn’t optimistic that this would catch on. One exception is the Ross River Resort (below) which is making the lessons, when convenient, part of the attractions of a trip to the magnificent East MacDonnells. This has turned 12-year-old year six pupil Ziggy Solczaniuk (pictured above and at right) into a bit of a star, a role to which he takes with flair. He says tourists hear about him in the school’s visitors centre, and as he is the student closest to Alice Springs, just 90 kms, quite a few do the trip. “They come, have lunch, have a chat with me, have a drink and go,” says Ziggy. “The School of the Air is cool. You get to go to school at home, you don’t have to catch a bus. “You don’t have lots of kids putting up their hands. Nevertheless Ziggy devotes five and a half days a week to learning, usually from 8am to 4pm, attending live lessons or doing assignments sent by email. “Auntie Janis,” who is actually a family friend of many years, is his tutor, by his side for most of his study. Ziggy has contact with teachers about four hours a week, either as one of his class of 15, or with one-on-one tuition with teachers such as Vicki Skoss (pictured below). The audio visual system is like Skype, only better, he says, the sound “is great and the picture is clear as day”. The conversations are either spoken or in an onscreen chat box which all students in the class can follow and participate in. Only when there is a lot of rain about does the satellite based system break down. Regrettably, visiting School of the Air kids out bush is unlikely to catch on as a tourist attraction. Mr Newman says parents are likely to think there isn’t enough to be gained from getting involved in tourism, and are probably put off by cumbersome Occupational Health and Safety requirements. He says the school’s visitor centre charges just $10 and most people can afford that. Children and locals are free. The current figure of 30,000 visitors a year is about half of the past boom times. It is possible that the new focus on big spenders by Tourism NT and Tourism Central Australia marketing will increase earnings but reduce numbers, and that would affect the takings of the school’s visitor centre. Mr Newman did not wish to comment on that. 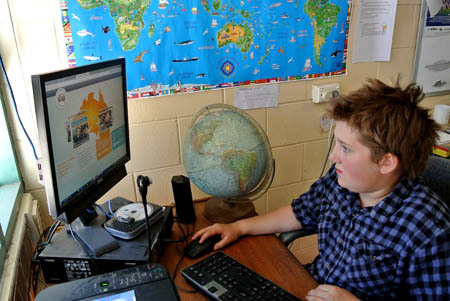 He finds that Germans – backpackers, mostly – are especially interested in the school because of a strong culture of home education in their country. He says the school’s technology is cutting edge. 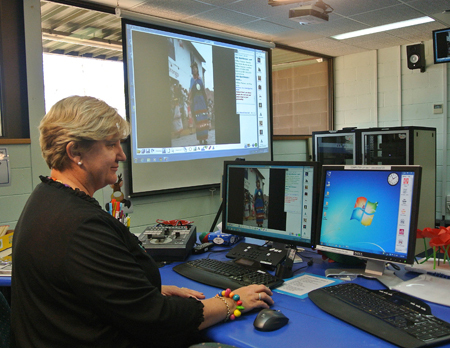 The Remote Education and Conferencing Technology (REACT), developed by Michael Wilson in Darwin, is now also used by the NSW TAFE and Distance Ed and the University of South Pacific which operates in 16 countries. ASSOA is one of NT Department of Education’s success stories. I fail to see why the model isn’t adopted for kids suspended or expelled from school for misbehaviour or disruptions to the rights of those other kids wishing an education. It’s a variation of the correspondence school. It probably sends shudders to them at ASSOA. But a special purpose virtual classroom could be set up with appropriately trained teachers for the recalcitrant kids and adolescents. A classroom could be established at the Youth Hub for town kids while community rooms in the local council, or as appropriate, could be set aside on remote communities. There would need to be a para professional / tutor or two on site but this, I believe, is the direction in which education will head: fewer teachers and more para professionals. Again I feel the need to say that all marketing should not be focused so heavily on one high end market. Places like AS School of the Air Visitor Centre and Ross River Resort are affordable to all and great attractions, so we need more visitors through Central Australia a not a select few. Great highlight Erwin on what makes so many want to share this fantastic region.